As you begin to learn songs, you will start seeing rock guitar chord patterns in the chord progressions that keep coming back time after time. What’s a chord progression? It’s just a pattern of chords put together to create a section of (or complete) song. These are usually repeated through the song. Start listening closely to rock songs, and you’ll hear the same rock guitar chord progressions over and over again. How is this possible? Aren’t all these songs original? What about copyrights? Conceivably, you could put together all sorts of different chords in different keys just to say your stuff is completely original, but hey, you want the tunes to sound good, don’t you? Like I mentioned before, there are thousands of chords possible, but for our purposes of getting you rocking quickly, you need to know the ones that work every time. That’s what’s great about music – you can have the same chord progression in two different songs and have the songs sound completely different. Just change the tempo, the melody, the lyrics, the style, the list goes on and on… Any new twist can make a song original. Music has been around for thousands of years. Unless humans quit liking it, music will be around for evermore. It’s just gonna change – new and different instruments, new styles, new tastes in music. Heck, who woulda ever thought Rap and Hip-Hop would become popular? JK (just kidding) peeps! So let’s cover some of the more common rock guitar chord progressions you are going to run into as you learn to play rock songs. We’ll run through some of the main progressions and I’ll give you examples of songs with the progression being highlighted. Then you can to listen to the song and hear how the progression sounds and works in the song. You can even pick up your guitar and play along with the song! Just to remind you – we can't cover all the possibilities here. You may need to adjust the frets you're barring with some songs to match the key. Bottom line, learn the rock guitar chord changes for the progressions. This way, you can adapt to whatever the pros are playing. Maybe you’ll be the next pro! 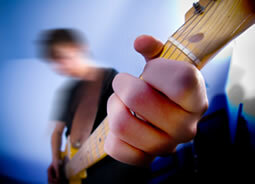 Sign up for the "Learn To Play Rock Guitar!" Newsletter - you'll get updates, lessons and cool tricks delivered right to your email! I'll even hook you up with FREE printable chord charts, including Drop D Tuning (my most popular 'alternate tuning' request!). This is a staple in the rock guitar chord progression diet. Click this link to check out some of the songs using this progression. With the D-Bm-G-A progression we have another switch-up of chords. I had some good luck finding songs for the electric guitar chord progression of G-D-C for the initial roll-out of this page. Of all the basic guitar chord progressions, I didn’t think it would be difficult to find songs for the G-C-D progression, but it was NOT easy! Maybe I just didn’t "cast the net" far enough out. That’s a good start for now, folks! These basic rock guitar chord progressions give you a good foundation to play thousands of songs. As you improve, you'll want to add more advanced chords to your skill set, but these should keep you busy for quite a while. Thanks for tuning in... and don't forget to sign up for the "Learn To Play Rock Guitar!" Newsletter and get the FREE printable chord charts.